Athens, Greece - A group of anarchists reported to be anywhere from 30 to 80 people in number marched through central Athens yesterday afternoon where they attacked shops, a bank, ministers’ offices, and a police station where they torched twelve police vehicles. The group chanted slogans expressing their solidarity with the revolting prisoners. Anarchists and police went head to head near Kaningos Square but no arrests were made and the group dispersed into the Exarcheia district, a traditional anarchist neighborhood. 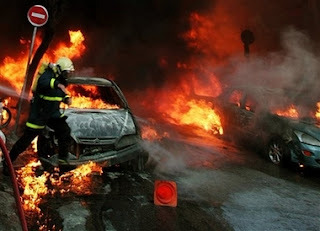 More arson bomb attacks were made against a bank and government targets overnight and early this morning among them were two cars belonging to Uruguay's ambassador to Greece. A group of anarchists firebombed a guard post outside a riot police camp in Zographou, in eastern Athens.